To execute a successful construction project takes more than just labor and materials. It takes effective communications and accurate, timely information to deliver great results. Our goal is always to provide up-to-the-minute project information that’s easy for the entire team to access, wherever and whenever it’s needed — starting in the design phase, through project close-out and for every milestone in between. That’s why we lead the industry in putting the most sophisticated technology solutions to work on every project. Not technology just for technology’s sake — but to help deliver quality, schedule and cost certainty you can count on. When every team member has real-time access to the information they need, we can all work seamlessly together. This enhances collaboration and directly benefits your project’s bottom line. Our secure McCarthy Project Portal was designed in-house with this result in mind. An easy-to-use dashboard provides access to project-specific apps, custom reports and analytics, building information models, progress photos, team calendar and more, all at your fingertips, anytime, anywhere. From your board room, to the designer’s work room, right to the heart of your active jobsite. Construction projects today are more complex than ever — faster schedules, tighter budgets, and one-of-a-kind designs are all part of the process. Technology is integral in our commitment to deliver a successful outcome for you. Our agile approach to technology is different from other contractors. As a builder, we listen closely to you to understand the requirements of your project first. Then, we bring you the most complete package of relevant technology tools combined with practical building know-how to help you achieve your unique goals. To do this, we’re constantly monitoring technology trends, putting new tools to the test and sharing best practices to continuously improve client results. You’ll find us working directly with tech giants like Oracle and Microsoft, software developers like Autodesk and Bluebeam, and product manufacturers like virtual reality leader Occulus, all to make their products work even better for our clients and partners. And, you’ll find emerging newcomers turning to us for R&D input and feedback. The rapidly advancing technology of drone technology allows us to view our job sites from a whole new perspective. Our in-house drone experts utilize drones to expand our ability to monitor and improve the quality of our work, provide additional information to clients and team members and further enhance the safety of our team members. 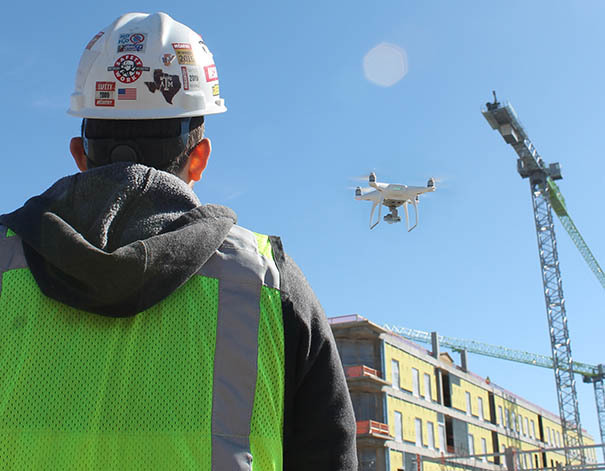 We’re now able to pilot drones to high floors of buildings for high definition quality checks, monitor and track material usage, conduct final safety sweeps before shutting down a job site for the day and much more. Drones allow us to work even more efficiently and effectively while maintaining our high standard of quality. Technology is evolving at lightning speed and can be a powerful catalyst to help achieve goals many considered impossible not that long ago. But technology only understood by IT experts is just the tip of the iceberg. We combine technical enterprise and field solutions specialists together into our ‘BIM enabled workforce’ to provide you with unsurpassed technical expertise — throughout our company. Together, we’ll work to understand the unique requirements of your project and recommend the right tools to ensure success. Finally, we put it all to work for you. That’s the team you get on every project. McCarthy is an industry leader in the adoption of leading technologies. They look beyond just the construction industry for innovative applications of technology and work with strategic technology partners to bring new ideas, applications and innovation to their projects. Ultimately, they focus on value-added solutions that improve operational efficiencies and quality to meet the unique needs of each of their clients. McCarthy partners with Loma Linda University Health to deliver unmatched patient experience. McCarthy's Joe Jouvenal discusses healthcare construction trends and the impact of cutting edge technology on healthcare delivery and the construction process. View How Can Hospitals Keep Up With Tech Demand? McCarthy guides Houston area teachers on tour of new High School for the Performing and Visual Arts using virtual reality.